Silhouettes, also referred to as shade drawings and shadow portraits, were typically cut out of black paper and mounted on white or ivory paper. When I began to study silhouettes to reproduce, I always found myself really loving the ones that were hollow cut with their bodies painted on. I love the pops of color, the old clothing, and I think it makes the silhouettes much more interesting. I paint on different hair styles for the ladies to include combs and ringlets, or maybe even a tiny eyelash. The ladies clothing is the most fun since I can use the brighter colors to create a puffy sleeved dress, a gold necklace, an embroidered collar, and perhaps a handful of flowers from her garden. The men are usually dressed in formal gray coats and white shirts, sometime with a lace ruffle. Many times I will add gold buttons to their attire. This one-of-a-kind family silhouette is an adaptation of old silhouettes with some of my own ideas thrown in as well. It is framed in an old gold frame and glass. The matte and each silhouette were hand cut with cuticle scissors out of antiqued laid paper, and are backed with black silk fabric. I've embellished the matte with gold leaf decorative "framing" around each silhouette. 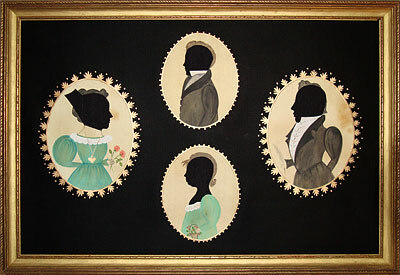 Antique family silhouettes are rare, very hard to find, and very expensive should you ever find one. I have been wanting to work on a family silhouette for some time now, and so enjoyed creating this piece. It It has a fairly formal look, but will also work well with the early American home. When you see it in person, you will not be disappointed.